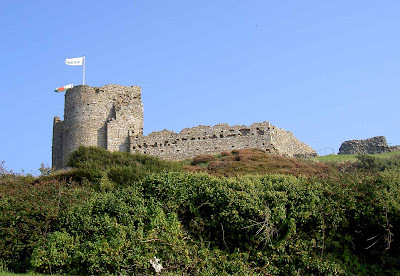 The magnificent castle at Criccieth sits on a rocky outcrop looking over the town below it, and the sea to its south. The castle's past has been affected by both Welsh and English hands, with the original castle being built by Welsh Princes sometime between 1230 and 1240, and later additions attributable to the English. The castle was most likely built by the Welsh, with the prominent twin towered gate house being the defining part of this building. The castle was later captured by Edward I, who strengthened the fortifications, and adapted the twin towered gatehouse so that it could be used as a huge catapult. These fortifications were tested after the castle had been adapted, when it was placed under siege by the Welsh. The attackers were however, unable to prevent supplies being sent to the castle by a sea route, and the defenders held out. In 1404, the castle was captured by the cheiftan Owain Glyn Dwr. He set fire to it and destroyed it to such an extent that it would never be used as a fortification again. The remains are open to the public. Check this link out for some more photos and information.